A beautiful and flavorful soup for a main entrée or first course! Not to mention a great way to get your beta carotene! Serves 4 – 6. 1 butternut squash about 1 or 1 1/2 lbs. Cut butternut squash in half lengthwise. Remove seeds and pulp from middle of squash. Place in cake pan flesh side down and fill with water a quarter of the way up the squash. Cover with foil and bake in a preheated oven at 375 degrees for 45 minutes or until fork tender. Be careful when removing foil because hot steam will be released. When squash is cool enough to handle, remove from pan and scoop out flesh. In a skillet add half of the bacon and sauté until crispy. Add onions and sugar and sauté until caramelized. Remove onions and bacon and place in blender. Add squash and chicken broth and blend to a smooth consistency. If contents of blender are near the top blend in batches. Transfer to a large pot and simmer for 15 minutes on low heat stirring often. Take the remaining bacon and cut into small pieces and sauté over medium high heat until crispy. Remove and place on a paper towel to remove any excess grease. 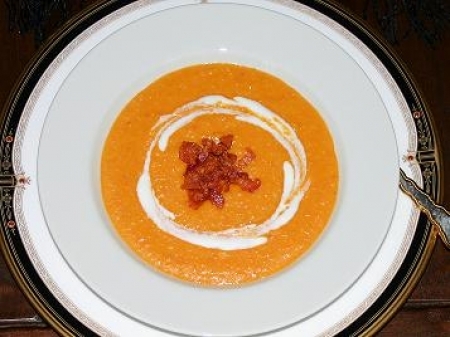 Ladle soup into bowls and use the diced bacon for garnish as well as the sour cream mixture. For sour cream mixture, mix all ingredients and place in a squirt bottle for decorating as shown above. Or simply add a dollop of sour cream. Try Chateau de Fontenille Grand Vin de Bordeaux Vintage (France), Solaire Chardonnay by Robert Mondavi (Santa Lucia Highlands) or Franciscan Chardonnay (Napa Valley, California).